AFRICANGLOBE – George Alcorn, Jr. was born on March 22, 1940, to George and Arletta Dixon Alcorn. His father was an auto mechanic who sacrificed so Alcorn and his brother could get an education. Alcorn attended Occidental College in Pasadena, California, where he maintained an excellent academic record while earning eight letters in baseball and football. Alcorn graduated with a B.A. in physics in 1962, and in 1963 he completed a master’s degree in nuclear physics from Howard University. During the summers of 1962 and 1963, Alcorn worked as a research engineer for the Space Division of North American Rockwell, computing trajectories and orbital mechanics for missiles. A NASA grant supported Alcorn’s research on negative ion formation during the summers of 1965 and 1966. In 1967 he earned his doctorate from Howard University in atomic and molecular physics. After earning his Ph.D., Alcorn spent twelve years in industry. He was senior scientist at Philco-Ford, senior physicist at Perker-Elmer, and advisory engineer at IBM Corporation. In 1973, Alcorn was chosen to be IBM Visiting Professor in Electrical Engineering at Howard University, and he has held positions at that university ever since, rising to the rank of full professor. Alcorn is also a full professor in the department of electrical engineering at the University of the District of Columbia, where he has taught courses ranging from advanced engineering mathematics to microelectronics. Alcorn left IBM, where he worked as a Second Plateau Inventor, to join NASA in 1978. While at NASA, Alcorn invented an imaging x-ray spectrometer using thermomigration of aluminum, for which he earned a patent in 1984, and two years later he devised an improved method of fabrication using laser drilling. His work on imaging x-ray spectrometers earned him the 1984 NASA/GSFC Inventor of the Year Award. During this period he also served as deputy project manager for advanced development, and in this position he was responsible for developing new technologies required for the space station Freedom. Alcorn served as manager for advanced programs at NASA/GSFC from 1990 to 1992, and his primary duties concerned the managing of technology programs and evaluating technologies which were required by GSFC. He also managed the GSFC Evolution Program, concerned with ensuring that over its 30-year mission the space station develops properly while incorporating new capabilities. Since 1992, Alcorn has served as chief of Goddard’s Office of Commercial Programs supervising programs for technology transfer, small business innovation research, and the commercial use of space programs. He managed a shuttle flight experiment that involved Robot Operated Material Processing System, or ROMPs, in 1994. The experiment involved the manufacture of materials in the microgravity of space. In 1999 Alcorn was awarded Government Executive Magazine’s prestigious— Government Technology Leadership Award (there were only two awards in all of NASA’s ten centers that year) for the development and commercialization of — THE AIRBORNE LIDAR TOPOGRAPHICAL MAPPING SYSTEM (ALTMS ) . 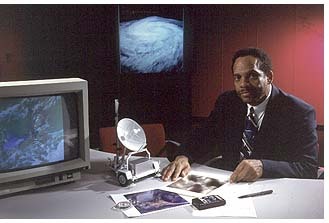 In 2001 Dr Alcorn was awarded special congressional recognition by Congresswoman Donna M. Christian-Christensen (D-VI) for his efforts in helping Virgin Islands businesses through application of NASA technology and knowledge of technology programs ..
George Edward Alcorn, Jr. is responsible for a number of inventions now widely used in the semiconductor industry. He is perhaps best known for inventing an imaging x-ray spectrometer which uses the thermomigration of aluminum, an achievement which earned him the 1984 Inventor of the Year Award from the National Aeronautics and Space Administration (NASA) and the Goddard Space Flight Center (GSFC). Alcorn has over 20 inventions. Some of these have been patented while others have been published. He is a recognized pioneer in the fabrication of plasma semiconductor devices, and his patent “Process for Controlling the Slope of a Via Hole” was an important contribution to the process of plasma etching. This procedure is now used by many semiconductor manufacturing companies. Alcorn was one of the first scientists to present a computer-modeling solution of wet etched and plasma etched structures, and he has received several cash prizes for his inventions of plasma-processing techniques. Alcorn has been extensively involved in community service. In 1984, he was awarded a NASA-EEO medal for his contributions in recruiting minority and women scientists and engineers and his assistance to minority businesses in establishing research programs. He is a founder of Saturday Academy, which is a weekend honors program designed to supplement and extend math-science training for inner-city students in grades six to eight. Alcorn also works with the Meyerhoff Foundation, founded by Freeman Hrabowski, whose goal is to encourage and support African American males interested in pursuing doctorates in science and engineering. Alcorn was honored by his alma mater Howard University in 1994 in its Heritage of Greatness awards ceremony. Alcorn was celebrated as a Black Achiever in the Science and Technology category. Alcorn married Marie DaVillier in 1969; they have one son, born in 1979. Alcorn’s younger brother Charles is a research physicist at IBM.